Thomas (1) Goble was born born January 2, 1590/91 in the village of Westergate, near Aldingbourne, West Sussex, England and migrated to America in 1634. Thomas, with his wife Alice, and son John, who was about 3 or 4 years old at the time, paid for passage on one of the many ships headed for "the colonies" (probably the Abigail, Hopewell or Lion), and migrated to America in about 1633 or early 1634, settling in Charlestown, Massachusetts. Either in route or shortly after arriving in the colonies, Alice gave birth to their second child and first daughter, Elizabeth, in 1634. Previous genealogical studies have suggested that Alice was Alice Mousall, the daughter of Ralph and Alice Mousall. However, according to newly discovered marriage records it is believed Alice's surname was Brookman. Thomas Goble and Alice Brookman were married at Aldingbourne, West Sussex on 5 November 1619. Thomas and Alice were admitted to the first Church of Charlestown on August 30, 1634. Thomas received his papers as a freeman September 3, 1634 (at the General Court) and was granted 4 acres "planting ground on Newton Line" the same year. To become a freeman meant to be granted citizenship and freedom to live in a city or borough. By 1638 he had not only amassed sizable land holdings but had increased his family by three additional children: Thomas Jr., born about 1635; Mary born February 27,1636; and Sarah, born in May of 1638. On October 1, 1640 Thomas Goble served on what is believed to have been the first jury ever to convene in Boston. It found Hugh Buets guilty of heresy and that "his person and errors are dangerous for infection of others." The defendant was ordered "out of the jurisdiction by the 24th psent, upon paine of death and not to returne, upon paine of being hanged." The jury was granted 12s (shillings) for their services (presumably 1s each). On December 13, 1653 "goodman goobell" paid 1 pound, 16 shillings "in Indian" (corn) for tuition and fees to Harvard College. This was followed by a similar payment on January 15, 1654 of 1 pound in "wheatt and Indian"; and a payment on December 8, 1655 by "old gobbell" of 1 pound, 14 shillings and 6 "d", 17 shillings "in wheatt" and 7 shillings, 6"d" "by Indian." The index of the Records of Court of Assistants of the Colony of Massachusetts Bay, volume 2, identifies "goodman goobell" and "old gobbell" as Thomas Goble. Thomas had become a respected citizen of Charlestown. He was a very wealthy man by the standards of the time and place, and consequently was probably important in local government. Land was at a premium at the height of the Great Migration, and settlement pushed out in all directions. Before moving his family to Concord they had another child, Daniel (2) Goble, born July 18, 1641. Daniel was hanged for murder in 1676. Thomas acquired a large farm near Concord, which upon his death on December 29, 1657 in Concord, Massachusetts, went to his son, Thomas (2), his third child. The farm remained in the Goble family for many years, as it was described in several deeds as "the land known as Goble's farm." The old house was still standing as late as 1904, and the farm could be located at the edge of "Walden Woods" on the road leading west from Lincoln Village near Concord "the land known as Goble's farm." 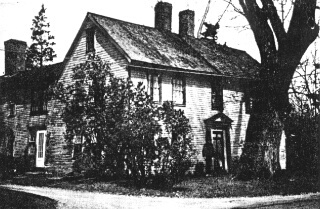 This photograph of the farmhouse of Thomas Goble is copied from Concord, a Climate for Freedom, by Ruth R. Wheeler, 1967. This book contained photographs of many of the homes of early Concord residences. She says of this house - "Goble farm house, later owned by Farrar, near the old Sudbury bound, on Wayland Road, Lincoln." Thomas Goble became one of the major investors and landholders of Concord. The old house and the farm could be located on the road leading west from Lincoln Village near Concord. Thomas's will was signed by him "the 30th day of the 9th month, 1657" (November 30, 1657) and probated December 29, 1657. Alice was still living at the time of Thomas' death, as she was mentioned in his will - "I give and bequeath to Alice my wife fair profit of all my stock so long as she liveth a widow...". The inventory taken of Thomas' estate listed some items which were only owned by the very wealthy, i.e. : "one featherbed, two feather pillows, & wool blankets, one small featherbed, two bolsters, two blankets, and one trundle bed, 40 pounds of paraffin, two iron pots." Bedding and linens were a mark of wealth, most people didn't have them. Paraffin would have been for candles of the highest quality, a real luxury item. Iron pots were manufactured items imported from England. Additionally, the mere fact that Thomas Goble could write his own inventory to the will and sign his name put him in a special class. Literacy was higher in New England than elsewhere because of the Puritan emphasis on reading the Bible, but still those who could both read and write were a minority. Banks Topographical Dictionary of 2885 English Emigrants to New England 1620-1650-GPC 1963. Records of the Governor and Company of the Massachusetts Bay in New England, Vol. 1, 1628-1641; pages 117, 312, 369. History of Charlestown, page 411. Wyman's Estates of Charlestown, Mass Vol. II page 411. Records of Court of Assistants of the Colony of Mass Bay, 1630-1692, Vol. 2, 1904, page 101. History of the Town of Concord, by Lemuel Shattuck, 1835, page 372. Concord, a Climate for Freedom", by Ruth R. Wheeler, 1967. Thomas (1) Goble's will, dated Nov 30, 1657. Terence T. Quirke, Jr. Ph.D. CG. who is a member of the Goble Family Association is descended from the Hawhurst England branch of the Goble family. Their progenitor was John Goble, born before 1638 in Etchingham, Sussex, England. Dr. Quirke has provided us with two interesting discoveries. While searching for records on Thomas, prior to immigration, a search of the Sussex Marriage Index revealed that Thomas GOBLE married Alice BROOKMAN at Aldingbourne, West Sussex on 5 November 1619. Dr. Quirke also researched the Aldingbourne, baptismal parish record transcripts in West Sussex and found Thomas and identified his father. "2 Jan 1590 (1591) Thomas filius Willmi GOBLE de Westergate." Follow this link to read Dr. Quirke's full report.